Drs. P.J. Fell and J. Brostoff; S. Soulsby, S.R.N. The Alcat Test ® is based on the change that occurs in white blood cells when incubated with purified food and mould extract. The test works utilizing a modified Coulter Counter linked to a computer programme which accurately measures the size of cells and at the same time counts their number. Following incubation any change in size that occurs or diminutions in numbers is recorded, and as a result of this the Alcat Test predicts a non-reactivity below a 9% change and positive reactivity above that figure. The test was subjected to a double blind investigation in 80 patients suffering from a variety of conditions, migraine, irritable bowel syndrome, asthma, and hyperactivity which might be food related. The test was assessed by choosing 3 negative, 3 positive foods and then randomly challenging patients with these, following a two week elimination diet. As a result of this pilot study which showed the correlation of between 70% and 80%, the test has been used in a clinic for some 14 months. 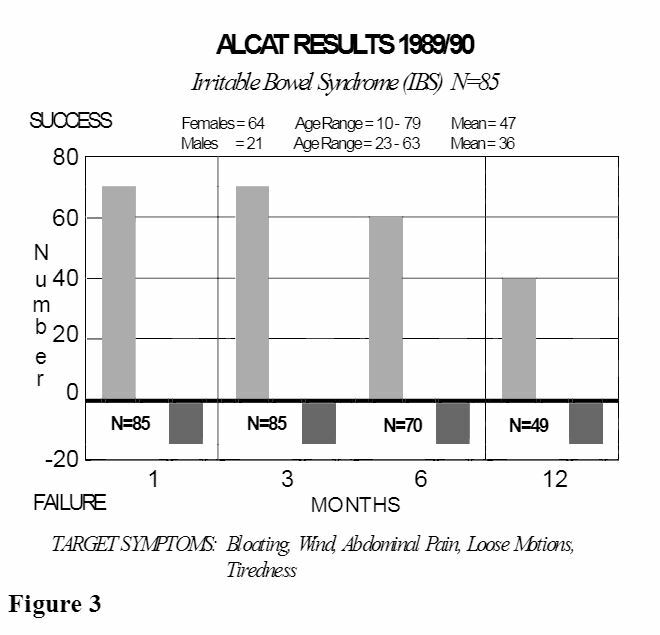 Over 200 patients have been monitored and the predictive value of the Alcat Test assessed. 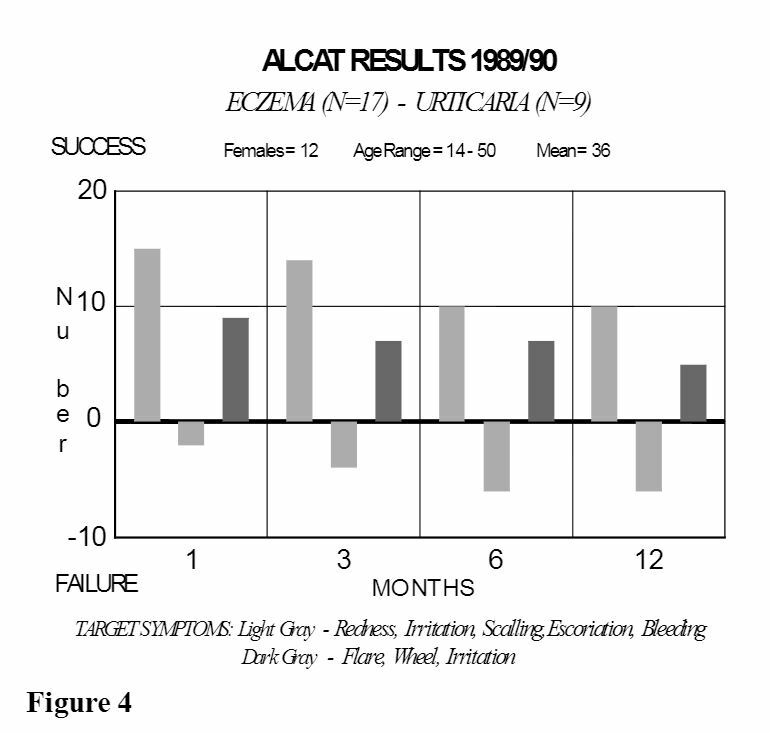 The assessment has been based on a two week elimination diet utilizing the non-reactive foods predicted by the Alcat Test and the outcome followed up for over a year in some cases. The difficulty of diagnosing food sensitivity (by any laboratory test) which is not IgE mediated is well known. The Alcat Test was developed to fulfill this lack and is based on measuring the change in volume and count of white blood cells between control and post incubated whole blood specimens with food extract. 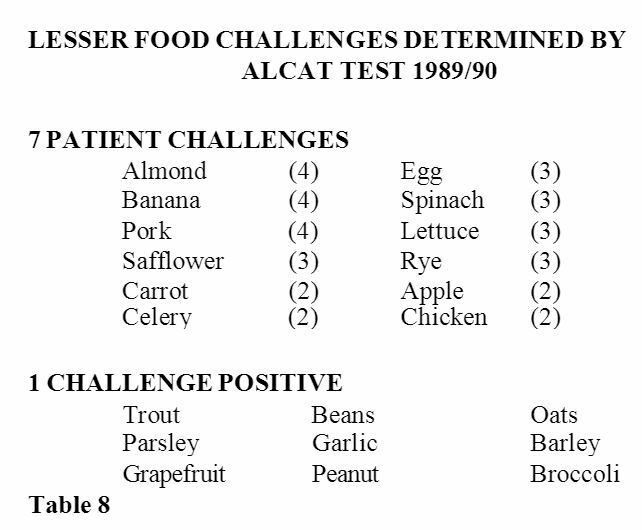 There are three blocks of work presented in this paper which correlates the predicted result of the Alcat Test with food challenge and elimination diets. A new test for food sensitivity based on the volume change in white cells following incubation with food extract is reported. The paper presents 3 blocks of work which correlate the predictions of the Alcat Test with blind food challenges and elimination diet. There were a variety of clinical conditions including irritable bowel syndrome, migraine, eczema, urticaria and arthralgia which were included as target symptoms for the test. 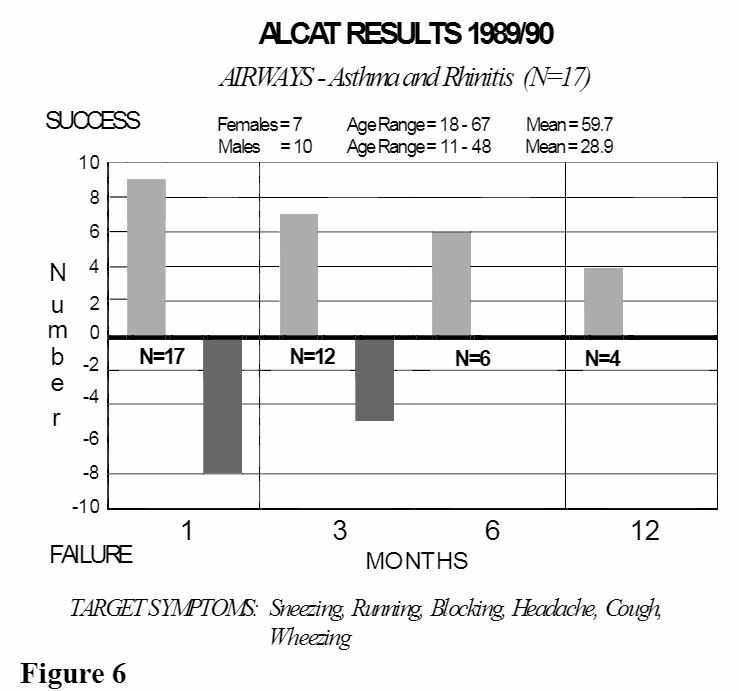 The first study was a pilot study to obtain results which would enable the accuracy predicted by the Alcat Test. The second was a double blind study in irritable bowel syndrome in 22 patients that had been thoroughly investigated for their condition and no cause found. The third block of work presented are the results using the Alcat Test in an allergy diagnostic laboratory for a period of one year. The results from these studies show clearly that the Alcat Test has a truly predictable capacity for detecting food sensitivity and warrants further investigation. Citrated fresh blood is diluted with 1:5 buffer and 500 microlitres added to each freeze dried test extract on nylon discs in Coulter type cuvettes. The solution is buffered as a physiological fluid to ph 7.4 with sodium bicarbonate. Following 45 minutes incubation at 37 degrees centigrade with constant agitation the cuvettes are incubated for a further 45 minutes at room temperature. The red cells are then lysed by adding 16 ml of Isotone II containing .5% alkalyse to each cuvette. The samples are then put through a modified Coulter ZF counter every 30 seconds with one control every 10 test cuvettes. A maximum of 100 substances can be tested but usually a battery of 50 foods is used. Having tested a number of healthy volunteers from the University of Miami Football Team, the test determined the percentage change in size of white blood cells in a healthy control group and less than 9% was considered normal. A variety of food sensitive patients were tested on an open basis and it was considered that the percentage shift in size of greater then 13% could be considered positive with the 9-13% range being considered equivocal. Once this process had been established and tested for reproducibility, it was then necessary to apply it in the field and assess its predictive value. The only sure way of assessment would be to use a blind control technique for food challenge in a variety of patients who were supposedly food sensitive. The first study was designed to be as unbiased as possible which is difficult with food challenges but nevertheless, we believe by including a large number of patients and applying careful statistical analysis and control, the effect would be a true result. 1. An elimination diet based on non-reactive foods for 2 weeks. 2. 6 separate food challenges each lasting a week (3 negative and 3 positive). The results of this study would be based on the daily collection of data on diary cards for each of the medical conditions – perennial rhinitis, migraine, eczema, irritable bowel syndrome, each had a different diary card. Should the patient suffer from 2 conditions then 2 diary cards of different types were provided. The patients were asked to score on a daily basis not only their symptoms but also the use of medication. The research nurse checked at the end of each week to ensure the diary cards were completed. Diary Cards: The diary card analysis would be carried out using a non parametric statistical analysis of variance and residuals to be checked to ensure the validity of the assumptions. The last 3 days of each challenge period was summed and compared with the 3 day period during the last week of elimination diet, reference to figure 2 shows that patients were randomized to food challenge after 2 weeks elimination. Each patient consumed the challenge food freely for 1 week and moved on to the next food thefollowing week. If a food caused adverse reactions it was stopped and they waited until the following week to start the next food. 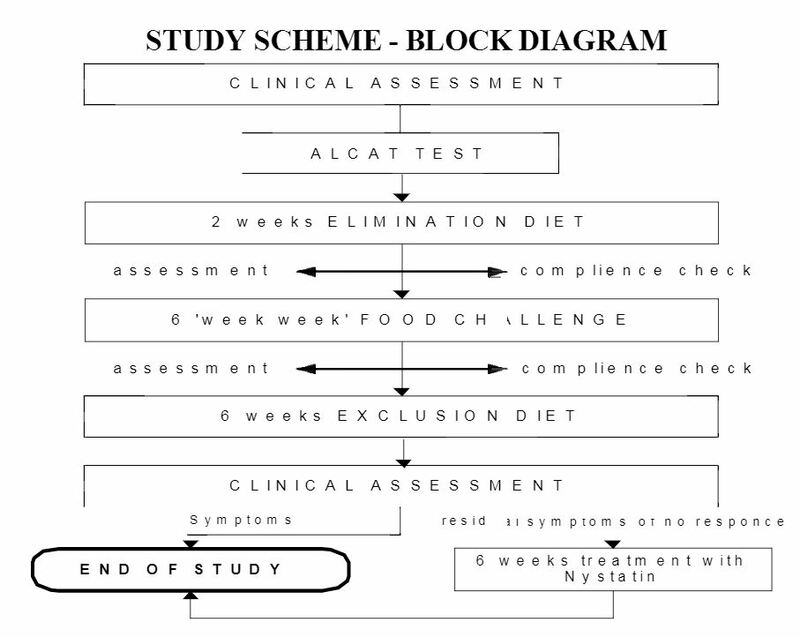 After a period of 6 one week food challenges the patients then completed a 6 week exclusion diet based again on the negative foods predicted by the Alcat Test. At the end of that time a clinical assessment was made and the study finished. Patients: Each patient for admission to the study must have had established symptoms for at least 1 year and have been fully investigated. The baseline being that each patient must complain of at least 2 of the target symptoms on the diary card before inclusion in the study. Patients: 22 patients were chosen all with at least a 3 year history of irritable bowel syndrome which had been fully investigated and no cause found. The same diary card analysis was used on this occasion subjected to the Student t test for each target symptom. Again the last 3 days of the elimination diet was compared with 3 days of food challenge. Foods again were randomly assigned positive or negative and each patient consumed 3 positive foods and 3 negative foods during the challenge period. The same target symptoms were used for each medical condition, patients were clinically assessed based on these at 1 month, 3 months, 6 months and 1 year. (Table 1) shows the 3 target symptoms used for each clinical condition. In addition a number of other patients were screened who did not qualify for any of these categories, these are described separately in the results section. Using a non-parametric analysis of variance and assessing the residuals to ensure the validity of our assumptions we compared the last three days of elimination diet with the last three days of the food challenge. The results were pooled and are described in Table 2. It will be seen from this table that 115 negative challenges and 51 moderate and 52 marked positive challenges were analyzed and both the mean and the standard deviation fall within the interquartile range making them statistically significant. However, the borderline is outside the interquartile range and is not significant. Therefore a total of 228 food challenges where the Alcat Test deemed as negative or positive result were of statistical significance. The results from this analysis were also interesting in that of ten patients stopping the challenge early because of adverse reactions, nine were on positive foods and one on negative foods. Furthermore, it was statistically significant that during the challenge periods more medication was used than during the elimination period or negative challenge periods. Making a global assessment of the diary cards on the completion of this study there were clear cut results for 143 challenges, 57 true positives with 18 false positives and 47 true negatives with 21 false negatives. These did not appear to be associated with any particular food challenge. Thus it was felt from this initial study that one could draw the following conclusions. 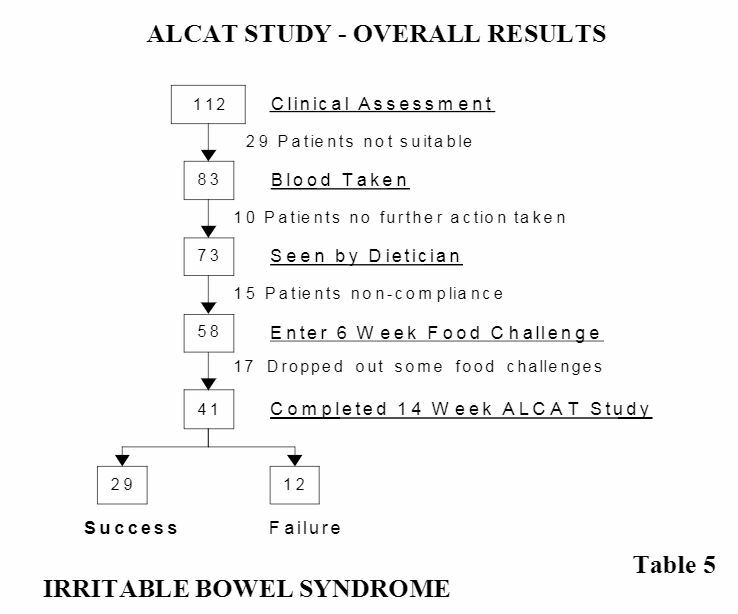 The Alcat Test worked in a clinical situation predicting a dietary programme which benefitted a range of patients suffering from a number of clinical conditions. Secondly, the Alcat Test negative and positive predictions correlates with the subsequent food challenge and is statistically significant using non parametric statistical methods. Third, by clinical assessment the Alcat Test simplifies for the physician the process of designing elimination/exclusion diets and challenges. It was felt therefore that the test warranted further investigation in a number of clinical conditions where food intolerance was suspected. There were 22 patients in this group, 6 male and 16 female with an age range of 15-72 years. Again diary card analysis was used but on this occasion subjected to a Student t test taking the last 3 challenge days versus the last 3 days of a 2 week elimination diet. 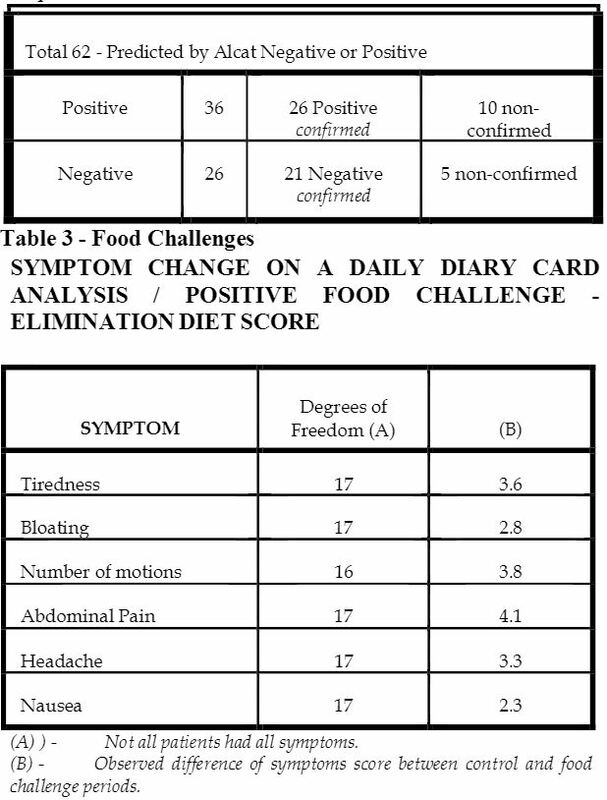 The number of food challenges was 62 and again reference to Table 3 shows a number of false positive and false negative on diary card analysis. 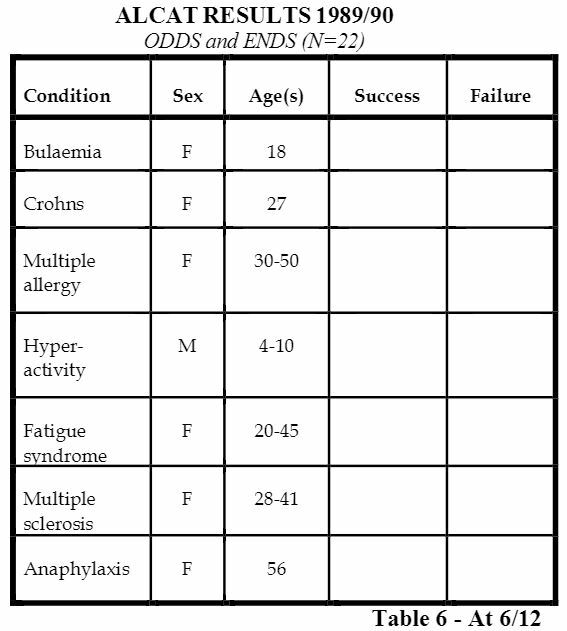 However, reference to Table 4 shows a clear cut result of individual symptom scores for this group. To achieve a statistically significant level of P<.05 it was necessary for symptom scores to become worse during the challenge period by a score of at least 2.1. As can be seen from the results this was achieved in all target symptoms measured. The study was then continued for twelve months using diet alone and success was maintained throughout this period. 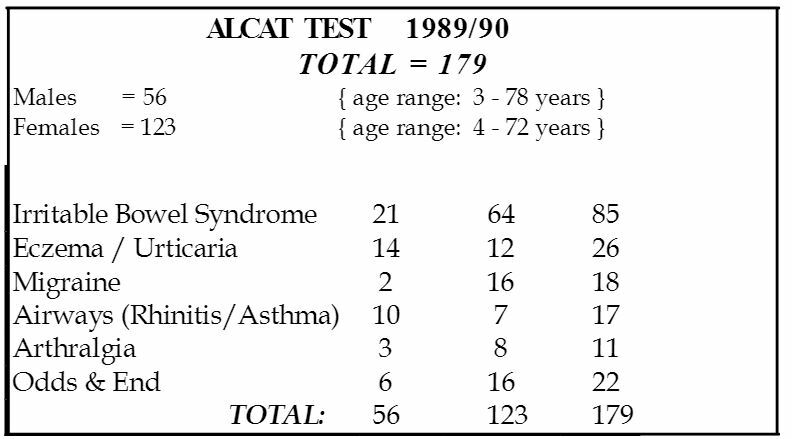 The result during the following year using the Alcat Test on patient attending the Allergy Clinics are reported. This was an open assessment, based on 179 cases, 123 females and 56 males, reference to Table 5 shows the distribution by clinical assessment based on each set of target symptoms was made at one month, three months, six and twelve months observation periods. It will be noted from Figure 3 that measuring the target symptoms, there was an initial success rate of 70 percent with 15 failures, this was maintained at 3 months but gradually the number of patients reaching 12 months fell until 49 completed 12 months again with 15 failures. It should be stressed that these patients were treated by diet alone and no other treatments. The next figure (Figure 4) demonstrates the results in eczema and urticaria totaling 26 patients, 9 urticaria and 17 eczema. Initially the results look to be excellent with 15 successfully treated eczema patients scored by target symptom improvement with only 2 failures, but gradually over the 12 month period more failures emerge and at 12 months the success rate was about 50%. The urticaria patients on the other hand showed only 1 failure out of the 9 and a maintained success rate at 12 months. Two of these patients resolved completely, but it should be remembered that this condition can be a self limiting illness. The next figure (Figure 5) demonstrating the results in migraine shows an excellent result after the initial failure of 4 out of the 18 patients. During the following 12 months, improvement was maintained, measured by scoring all 4 target symptoms. lnterestingly, several of the patients observed that although an aura developed, there was a failure of the full blown syndrome to develop with headache, nausea, and vomiting. Reference to (figure 6) for airways, asthma and rhinitis totaling 17 patients is less encouraging than the previous sets of results, but in a way is not surprising considering inhalant allergens play a major role in these conditions. Nevertheless, it is interesting to note that 4 patients have continued to be well maintained on diet alone with occasional use of concomitant treatment which is recognized by them to be more successful since dietary manipulation was used in addition. However, one should take note of these figures as there appears to certainly be a group of patients who are not food sensitive in any way. The last major group (Figure 7) that we considered are extremely interesting. They are those that suffer from arthralgia i.e. pain in the joints with stiffness but have a completely negative biochemistry and ESR and serologically are not suffering from rheumatoid arthritis. The syndrome is commonly present and worse in the morning. This group did exceptionally well with 1 failure initially and the rest showing success over the twelve month period. Of the Initial 10 patients, 6 have maintained theirimprovement and of the six, in three, the condition has resolved completely. Furthermore, it is interesting to note in this group that a small number of foods have been identified as causative agents and eliminated where as in the irritable bowel group and migraine there are often large number of foods incriminated. Lastly there are a group of patients labelled “odds and ends” (table 6) and attention should be called to some of these groups. The most interesting is the hyperactivity group, all males aged 4 – 10 years. Out of six, five have maintained a remarkable improvement after six months. The mothers report quite marked results from incidental food challenge positive but the change appears to be short lived and over the several months observed hyperactivity has been reduced greatly by dietary manipulation. The other group, fatigue syndrome, all females aged 2 – 45 also showed improvement by the use of an elimination diet. 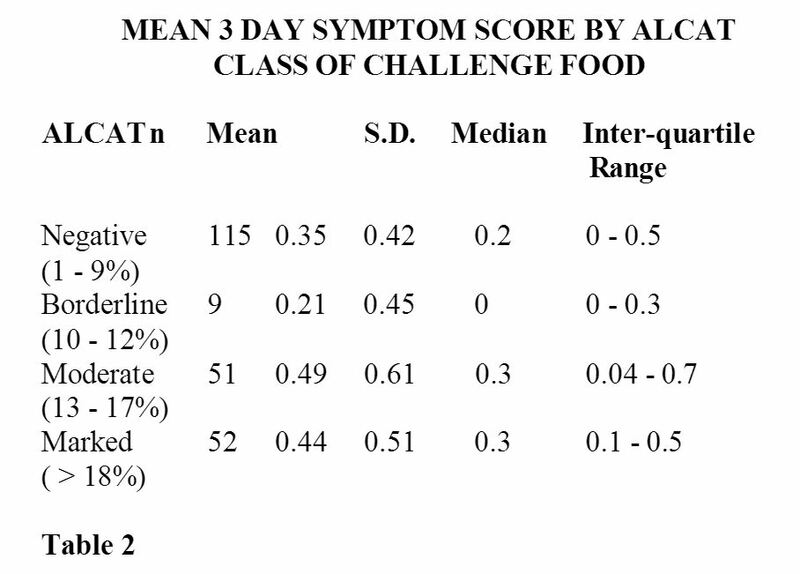 It is the view of many physicians interested in food sensitivity that it is possible with skill and knowledge to determine the commonest foods causing the illnesses so far presented and certainly the four commonest foods detected by the Alcat Test in (table 7) would support this view. In 169 patients challenged more than 10 patients showed a positive result to potato, yeast, milk and wheat. These would often be eliminated in many of the conditions presented as would the second group of foods with perhaps the exception of sugar and peas. 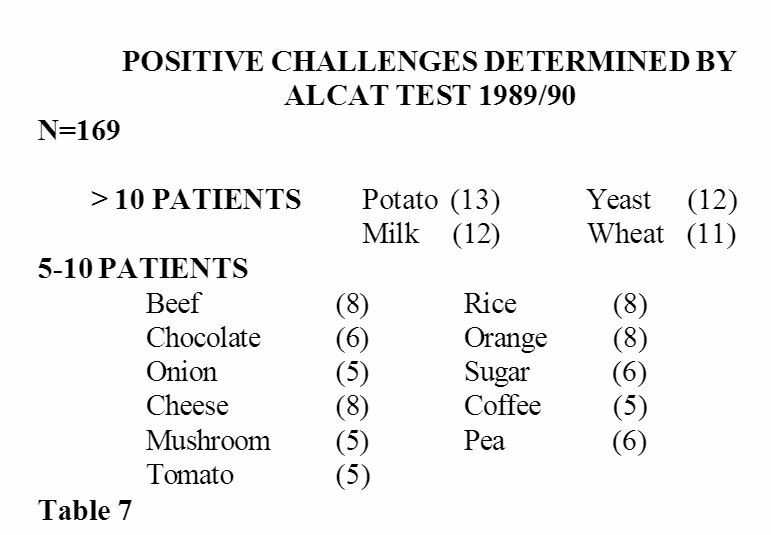 However, reference to (table 8) is perhaps where the Alcat Test comes into its own and that is identification of unusual foods some of them included in elimination diets and several often included on oligoallergic diets, carrot, celery, oats and barley, would normally not be thought of as major problems but here a definite effect from food challenge and prediction with the Alcat Test means that these foods have been incriminated making their elimination important. 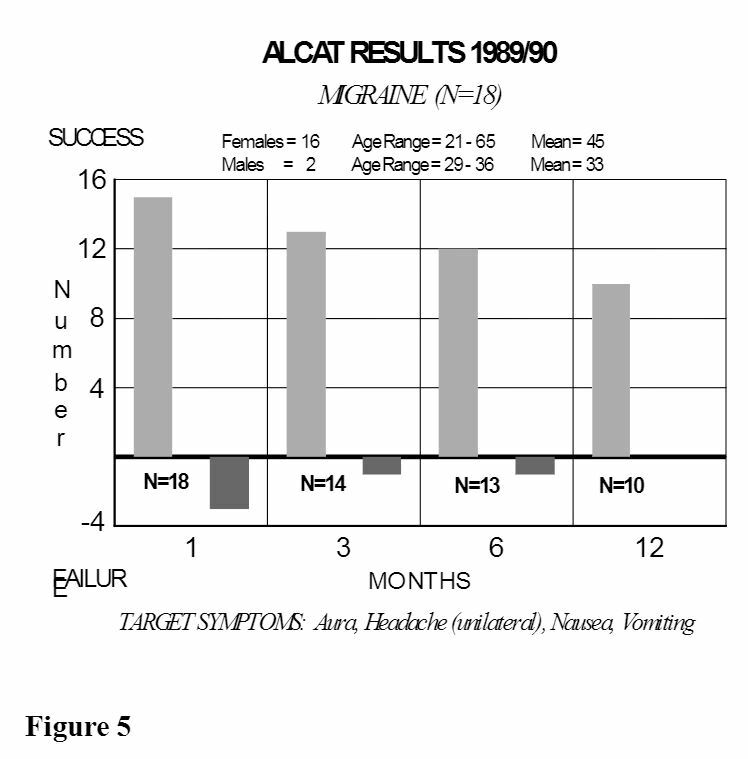 To summarize all the results, it is possible to state that the Alcat Test does predict foods which are reactive and non reactive and this has been statistically proven. The proof has been found in a number of clinical conditions often thought as related to food sensitivity. Furthermore, a consequent challenge with that food has produced an adverse affect, or in the case of negative foods has failed to do so. The foods identified are highly variable, the commonest foods seen in patients suffering from sensitivity syndromes are also those determined by the Alcat Test, but the plus point of the test seems to be its ability to identify unusual foods that would not commonly be eliminated by the physician. There are a range of mechanisms both immunological and toxic which are known to affect cells in-vivo and in-vitro.1, 2The mechanism by which ALCAT detected the change involume is objective and definite but the mechanism by which it occurs is unknown. It is important that further research is carried out to determine what these changes are involved. It is highly likely that this empirical test confirmed as accurate and applicable by sound statistical methods is demonstrating a final common pathway from a variety of mechanisms which produce cellular changes in-vitro (3). It will be important to continue to correlate and confirm the in-vivo results in a variety of clinical syndromes and also in those already identified to look at other factors involved in production of symptom complexes. 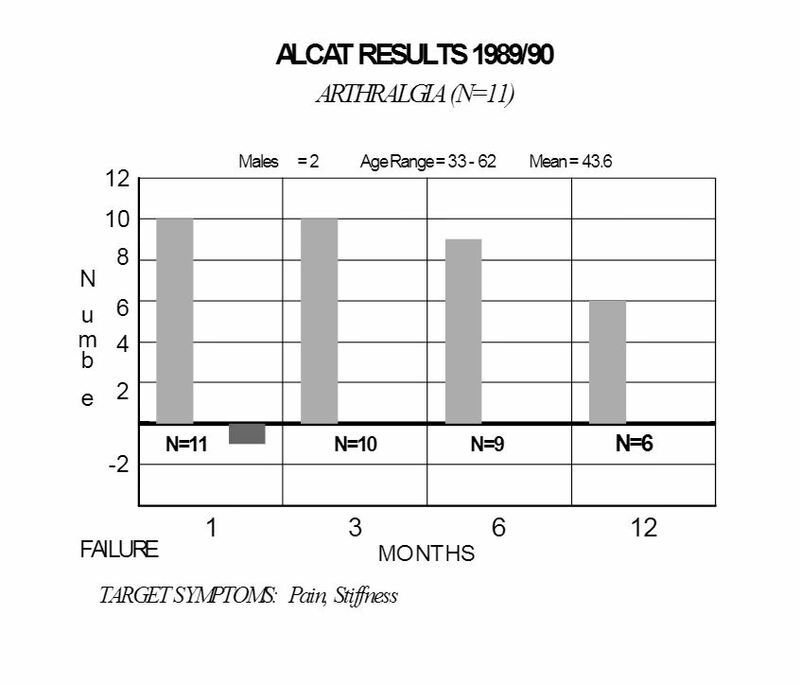 The Alcat Test is easy to perform by technicians with a minimal amount of skill and is reproducible4 and does not vary with an individual with time5. It is therefore, our view that this test has a valuable part to play in the armamentarium of the physician concerned with food sensitivity but does not in any way replace a careful clinical assessment. It is interesting that the inhalant versus food or the inhalant plus food affect in the airways patient will only be determined by a careful clinical assessment. Furthermore, it is important that other tests that are complimentary to the Alcat Test and measure immunological change such as RAST/lgE and mediator measurements6 are used in unison to attempt an accurate profile of the syndrome concerned. It is likely that this will also determine the treatment given and enable insight into the mechanisms concerned with food sensitivity. It is known that lectins and other natural products may be actively cytotoxic7 and immunological mechanisms exist for cellular change8 and often none of these can be found and that an auto-cytotoxic affect can be demonstrated without previous priming with antigen or antibody, it is only by the use of a number of tests that these mechanisms will be finally resolved. 2.Podleski, W.K. Autocytotoxic Phenomenon in Bronchial Asthma. Intrinsic Asthma. Birkhouser Verlog Basel 1989. 3.D.L.J. Freed. Laboratory Diagnosis of Food Intolerance. Food Allergy and Intolerance. Ed. J. Brostoff and S. Challercombe. Balliere Tindall. 1987, Ch. 23 p. 425-450. 4.A.M.T.L. Technical Report No. 2021 A.M.T.L. Corporation. 19100 Dixie Highway. Miami. Florida. 5.A.M.T.L. Technical Report No. 2021 A.M.T.L. Corporation. 19100 Dixie Highway. Miami. Florida. 6.Bjorksten, B., Ahlstedts, S., Bjorksten, F., et. al. IgE and IgG4 Antibodies to Cow’s Milk in Children with Cow’s Milk Allergy. Allergy 1983; 38: 119-124. 7.Finn, R. Pharmacological Actions of Foods in Food Allergy and Intolerance. Ed. J. Brostoff and S.J. Challacombe. Balliere Tindale. 1987 Ch.23 p. 425-450.